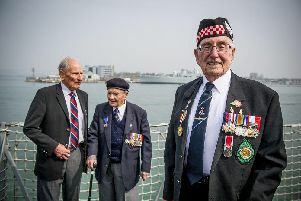 Adam Macleod, 100, of Gosport, who has spoken about his wartime experiences. RECLINING in a red seat inside his bungalow, great grandfather-of-five Adam Macleod gazes fondly at a black and white photograph of himself from 75 years ago. The picture is faded slightly but the face of a young man with well-trimmed, dark hair and wearing a crisp naval uniform is still clearly visible, his arms folded showing the distinctive wavy rank insignia of a Lieutenant Commander in the Royal Navy Volunteer Reserve (RNVR). jpns 060618 rw Adam Macleod''Adam Macleod when a lieutenant commander in the RNVR 1944. Adam, now 100, was one of the few civilians involved in the Normandy invasion and played a critical role in keeping the enormous armada of warships and troops supplied with ammunition. Now, as the nation prepares to mark the 75th anniversary of the June 6 raids, he has revealed what his life was like during the assault. Adam’s journey to D-Day started back in 1937, when he joined the Royal Armament Supply Department of the Admiralty - the civilian department responsible for procuring, storing and issuing explosives and ammunition to the Royal Navy and Royal Marines. As war broke out he was sent across the globe, tasked with resupplying the fleet wherever it went. He later volunteered for the armaments department and travelled throughout the UK delivering arms. But weeks before D-Day, Adam was summoned to Norfolk House, London, the Supreme Headquarters of the Allied Expeditionary Force, where he was given a docket to visit a tailors for the uniform of a Lieutenant Commander RNVR. It was in preparation for him to join the Normandy invasion force and would be the only time he wore it in active service. Had he been caught by the Germans wearing civilian clothing he would have been shot as a spy. After obtaining his new uniform, Adam was again called to Norfolk House, this time to be briefed on his role as officer in charge of armament supply for the British fleet. He was also shown the secretive plans for the invasion - and was stunned by what he felt was a ‘lack of security’ surrounding them. ‘I arrived there in this brand new, shiny uniform and there was this rating who saluted me instantly, never asking for a pass,’ he says. ‘I told him who I was here to see and this rating said “upstairs, sir, first left and second right”. Adam met the Royal Navy officer who showed him the plans for Operation Neptune - the code name for the Normandy invasion. Inside was the detailed plan for where every ship would be in the English Channel in the hours before D-Day. Adam says: ‘The officer told me he had to leave and asked me to lock up the plans in a wooden cupboard. Adam received his mobilisation order while at a dance on the Isle of Wight. He rushed back to his RFA vessel in the Solent and set sail on June 6, arriving off the coast of Normandy early the next day with the mighty 16in guns of HMS Rodney firing over the heads of troops. Adam’s first role was to resupply the 4.7in guns of the landing crafts. He also issued more than 50,000 ‘scare charges’ to the fleet - devices used to kill underwater swimmers tasked with attaching mines to the Allied ships. Adam transferred to the Southern Prince where he was allocated a DUKW, an amphibious 2.5-tonne truck. It had a crew of three Royal Marines and they anchored 100 yards offshore to supply troops with ammunition. The DUKW ran back and forth for a fortnight until the temporary Mulberry Harbours were anchored. One memory that stuck out for Adam came after a few weeks of being ashore, when he saw the bombing of Caen. ‘It was a lovely sunny day at the end of June,’ he says. ‘I heard the buzz of aircraft and I looked across the coast to Caen and low and behold 1,000 Allied bombers were staring a bombing run. ‘They dropped 700,000 tonnes of bombs on the city, including armour-piercing bombs on the docks - that we wanted to occupy. ‘I went along with an officer the next day and everything was rubble. A Frenchman with a badge of office - like a mayor - came up to us furious. ‘He said why did we do it, the Germans had left the day before. He was very angry. More than 2,000 civilians died in Caen. Adam remained in France until August when he returned home. He stayed in the civil service, supporting the Royal Fleet Auxiliary for 41 years. He now lives in Staplers Reach, in Bridgemary. He has four children, 12 grandchildren and five great-grandchildren.